The Torres Strait Islanders are Australia's 'other' Indigenous minority, Melanesians living on islands north of Cape York and now scattered all across Australia. This is a culture rich in customs, myth and legends. "The Tombstone Opening" is a joyous ceremony performed years after the funeral to release the spirit of the deceased. Also called an Unveiling, it has nothing to do with exhumation, but refers to the moment when the last veil is unsheathed from the tombstone for everyone to see for the first time. 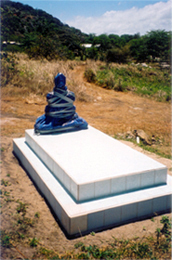 Frances Calvert, long-time friend and film-maker to Torres Strait, returned to Thursday Island at the request of the family of Ephraim Bani, protagonist of her award-winning film CRACKS IN THE MASK, to record this unique if costly ceremony. Lyrically narrated by Ephraim Bani's grandson, the film explains and contextualises the ceremonies, protocols and songs for an outside audience. The film explores traditional obligations, attitudes to death and hopes for Torres Strait culture to survive in modern, secular Australia. A Torres Strait Islander sets out on a voyage of discovery to the great museums of Europe where his cultural heritage now lies. Traces the story of the life of an extraordinary man, one whose struggle for land rights, and his remarkable life in general, had a profound effect on indigenous rights in Australia.